The word ‘circus’ dates back to Roman times, and typically referred to a building used to reenact military battles for entertainment or to display horses and exotic animals. In 18th century Europe, the word was revived for live shows that involved animal acts in some form or another. Most of these circuses remained in one location, but a few traveled from city to city in horse-drawn wagons. They were limited both in the distance they could travel, and to animals and props that were compact enough to be moved by wagon. What we think of as a circus in modern terms--a large troupe that tours from city to city and performs inside of a large tent--wasn’t feasible until the railroads arrived and could move large amounts of people and equipment quickly from place to place. Travel by train was one of the many innovations implemented by the “King of Circus,” P.T. Barum, whose name still graces the modern circuses managed by the Ringling Brothers and Barnum & Bailey company. Barnum and his partner at the time, William Coup, first rolled and secured their circus wagons onto flatcars, but began to purchase their own rolling stock so they could keep the equipment maintained to a higher standard than the railroad's and could customize the cars to the circus’s needs. Many other circuses followed suit. Moving by train did more than just increase the geographic scope of circus tours. It was now possible for crews to take along large tents too bulky and heavy for wagons. The circus managers could also choose where to setup their show instead of being limited to theaters and fairgrounds already constructed in the towns along their route, and were freer to expand the size and number of rings underneath the big top. In an age before television and detailed photography, the circus was virtually the only place where an average person could get a sense of what an exotic animal looked and sounded like. Elephants and other animals, such as giraffes, zebras, and large cats, began to play a more prominent role in circus shows. Indian Elephants were particularly prized, given their intelligence and large size that thrilled audiences and could be used to assist the process of setting up the circus. Their acts soon became one of the most iconic aspects of the American circus. The first African elephant to reach the United States alive, and the first animal superstar to be widely promoted in the media, was an elephant named Jumbo whom P.T. Barnum purchased from the London Zoo. He stood approximately twelve feet tall at the shoulders and was the largest captive elephant known at the time. 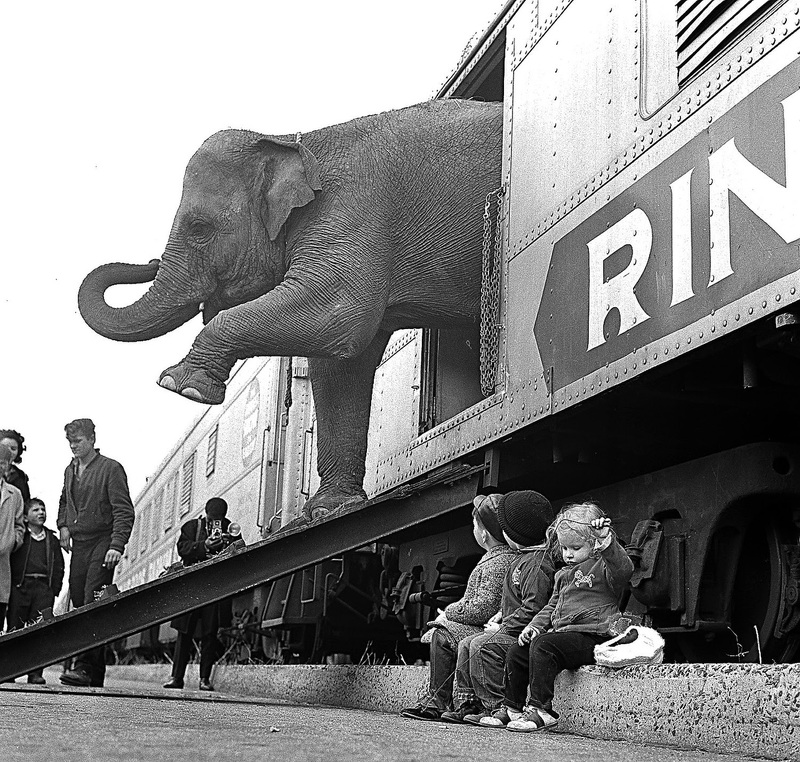 After much reluctance from the people of London and from the elephant himself, Jumbo arrived in New York City to a crowd of almost 10,000 people. In Britain, he had displayed a moody temperament--he permanently broke his tusks off in a tantrum--but seemed better disposed as he began touring with the circus and spent almost every hour of the day with his trainer Scotty. Jumbo performed with Barnum’s circus for four consecutive seasons. His shows were highly publicized by contemporary media outlets and were attended by an estimated 20,000 spectators. 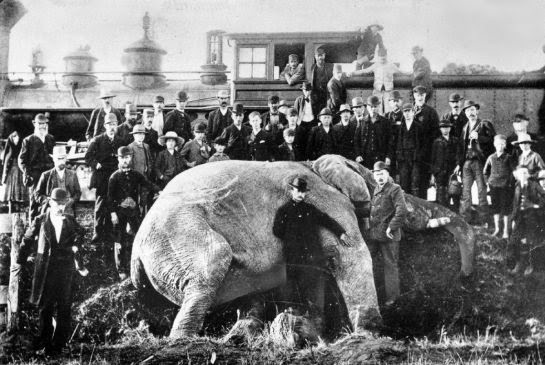 After only three years of circus tours, though, Jumbo was killed when an unscheduled freight train plowed past the circus train just as staff was loading the animals. Pinned between the circus cars and a steep embankment, Jumbo was unable to move out of the locomotive's path. He died within Scott’s hand clutched in his trunk within fifteen minutes of being struck from behind. The collision was powerful enough to derail the oncoming train. Elsewhere in the world, in elephants’ natural territory, there is a more pronounced intersection of animal and machine. 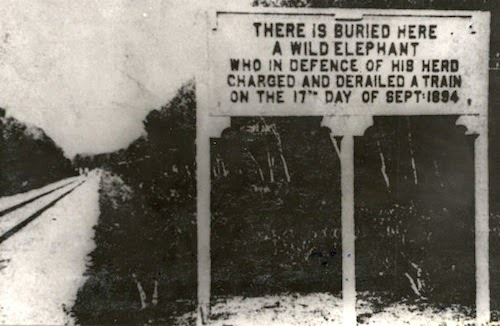 In India and other locations with native elephant populations, local people expanded a long tradition of using the animals for labor and put their strength to work on railroad construction sites. Elephants were well suited to carrying the supplies needed to build new lines, and their weight was sufficient to tamp down the ground beneath the roadbed simply by walking over the area. 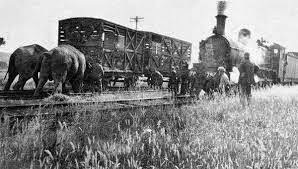 When the railroad lines were finished, it was not unheard of to put elephants to work in rail yards, especially where there was a shortage of engines, but a single elephant was strong enough to quite easily take the place of a small shunting locomotive, and had the advantage of being far more maneuverable around the tracks. There is a significant body of evidence indicating that elephants, in addition to possessing self-awareness and an uncommonly high intelligence, experience a wide range of emotions. The way that surviving heard members of elephants killed by trains react supports that they are fully capable of experiencing loss and grief. In the aftermath of many of these incidents, the surviving members of the deceased elephant’s herd will refuse to leave the sight of the accident and appear to hold a vigil for the dead. 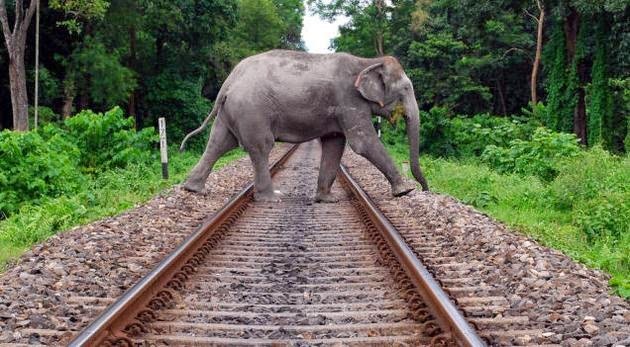 In at least one documented case, a herd of elephants appeared to take revenge on a nearby village after one of its members was killed by a train, and there is a memorial along the Malaysian railroad tracks commemorating an elephant that died after intentionally charged and derailed a train. 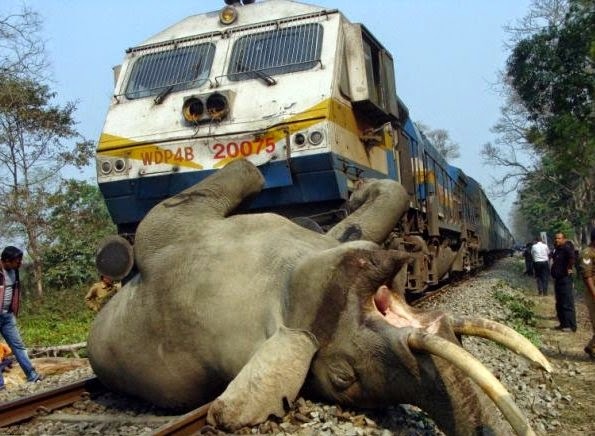 We cannot know for sure what any other species of animals thinks or feels, but it is within the realm of speculation to imagine that elephants are capable of understanding the railroads as a threat and agent of change. * RB&BB does not allow photography inside of the animal cars in order to verify the exact conditions under which the elephants travel. **Given the length of these railroad lines, the size and strength of elephants, and that they are intelligent enough to figure out ways around many barriers and enclosures, it isn’t feasible to simply fence off the tracks.